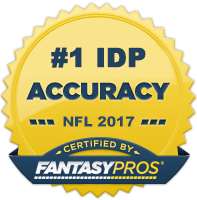 Week 4 was the return of the IDP injury bug. We lost Mayo, Harrison, Hope, and T. Cole for extended periods of time. Here’s the injury update for IDP’s. Haden sprained his knee early in the game vs. the Titans. He went for an MRI on Monday and according to Pat Shurmur, it will not require surgery. He didn’t practice Tuesday but heading into the BYE week, it was wise to let their shutdown corner rest. Having missed his 3rd straight game Sunday, Champ promised he’ll be out there come this weekend. Playing on a national stage, everyone got to see a disgusting dislocated ankle injury. He went on IR on Tuesday. Kampman is scheduled to make his return this weekend vs. Cincinnati after sitting out to rest his surgically repaired knee. Scheduled to miss the next 6 weeks due to a sprained MCL. Heading towards another game time decision here. We won’t know anything until close to game time. He isn’t expected to practice this week. Thomas will miss the remainder of the season with a torn Achilles. Cole is expected to miss 3 weeks with a strained calf muscle. Smith is not expected to play vs. the Titans this week, but has not been formally declared OUT. Harrison will miss “several weeks” with a fractured right orbital bone. Hope suffered a broken right arm in Sunday’s game and will miss the next 4-6 weeks.